What better way to welcome fall and our upcoming favorite holiday, Halloween, than to add one of the best mystery shows there is to your collection, Scooby Doo.The 13 Ghosts of Scooby-Doo! The Complete Series, appropraitely has 13 episodes of Scooby-Doo thats a whopping five plus hours of Scooby-Doo and Shaggy too fun! Scooby-Doo truely seems to be the cartoon that just keeps on going, Scooby-Doo was popular when I was a kid and even way before my time as well. Who can blame them though its just one of those shows that's endlessly fun. There are always new mysteries to solve, always more ghosts, always more people to reveal as wrongdoers, though their wardrobe has changed a bit over the years it's still the same gang that I watched as a child and it still has the same appeal. Most importantly compared to some children's programing these days Scooby-Doo is one of those shows I can let my kids watch without wondering what they are truly watching and if I should be monitoring every word. What's not to like about that? The 13 Ghosts of Scooby-Doo follows Scooby-Doo and his friends as they investigate 13 of the world's meanest baddest "real" ghosts all of which were once trapped in the Chest of Demons and have now been let free.. by Scooby-Doo himself. Not that Scooby actually meant to do it but you know how he is always putting his nose into things that he most likely should have left alone! It's now up to Scooby to return all the ghosts to the chest and fix the big mess he created in the first place! Each episode in the collection follows Scooby as he finds and captures all the ghosts he so unwittingly let free! 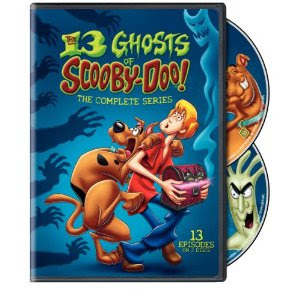 Also including on The 13 Ghosts of Scooby-Doo is a special bonus episode from the Shaggy & Scooby-Doo get a Clue series. Heh, appropriately titled as they might just need a clue after cleaning up the whole ghost mess! The 13 Ghosts of Scooby-Doo The Complete Series is available right now and you can pick up your copy on Amazon ! Disclosure: We were given a copy of The 13 Ghosts of Scooby-Doo The Complete Series free of charge, we were not compensated for this post in any other way. My opinions and comments on items we review are always my own and are never influenced by sponsors. Keane loves loves loves Scooby Doo!! !